Failing to initiate customer interest? Is there a hiatus in communication, have they postponed their purchasing decision? Are they considering different providers? Chances are that you may have lost these leads. But perhaps not, maybe they are not ready to buy. Not just yet. You can still retain them to the sales pipeline with continued lead nurturing. 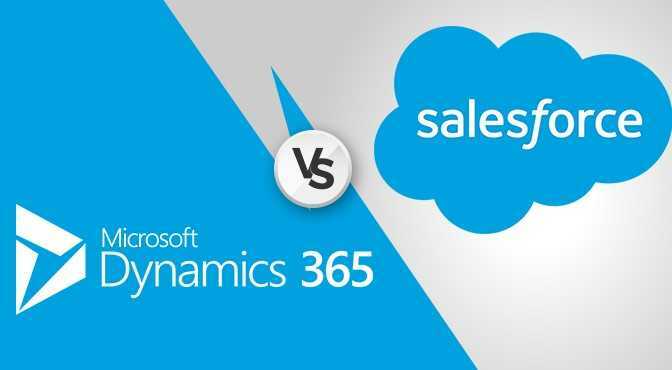 So here is the Competitive comparison between Microsoft Dynamics 365 vs Salesforce. To get a better handle on your sales department, you need optimal CRM software. It will help you generate leads, manage customers and close more deals. In fact, market Research tells us that organizations that excel at lead nurturing generate more than 50% sales-ready leads, that too at 33% lower cost. As no sales representative can sacrifice the amount of time needed for communication with stronger leads, the CRM software must be equipped with functions that can nurture leads. There has been a lot of buzz around CRM software and most of the talk is around two key players, i.e. Microsoft Dynamic 365 vs Salesforce. They are referred to as having the best features in the market, but the question remains – which one is better? There are six scoring factors for Microsoft Dynamics 365 vs Salesforce that their winning points will be based on. The two platforms will score as per the convenience of their mechanism and completeness at every stage. As timing is a key element for online communication, the lead nurturing mechanism should also comprise customizable alerts, ‘to-do’ dashboards, automatic email responses and reminders to sales representatives to contact within the decided time frame. Businesses need to plan ahead to qualify important leads that are to be prioritized and accordingly plan nurturing endeavors. After the execs have given their criterion for lead qualification, the CRM software can stream the process with immediate in-app approval, automatic lead scoring and collaboration tools for marketing and sales team. Being attentive to the lead’s activities, (like for e.g. browsing history, click to the links and emails opened) allows sales representatives to understand the lead better, about what they want and then timely give them the same. In this aspect, the CRM can assist with automated tracking of customer interactions, trailed by content suggestions and nurturing plan changes. Features needed under ‘alertness’ are on-the-go campaign analytics, automatic delivery of emails as per predefined timetable and completeness and convenience of the nurturing workflow automation. To provide a personalized experience, the CRM must create multiple paths for lead nurturing for a particular segment. As the amount of customer segment increase, the convenience of filters utilized for fine-tuning lead nurturing workflows is essential. An organization generates optimal lead nurturing practices by analyzing its success stories. CRM software should have analytics and a reporting feature to assist in identifying content, communication networks and activity time frame that have the bigger effect on conversion rate. Lead nurturing solutions should be flexible enough to permit collaboration between the marketing and sales departments at as many nurturing phases as a company requires. Microsoft Dynamics 365 offers Dynamics 365 for Sales and Dynamics 365 for Marketing solutions for lead nurturing. Final Judgment – In-CRM lead nurturing will be effective for re-engagement or long-term engagement campaigns aimed at a limited amount of most valued leads. Microsoft Dynamic for marketing will be discontinued next year and by that time we can expect Microsoft Dynamics 365 for marketing to be introduced in the market. As Microsoft improves its UI and capabilities with the latest version, this analysis is based on the pre-release information. Dynamics 365 for marketing will feature a much more convenient app navigation and will mostly remain as same as Dynamics marketing with few improvements, like channels extended with LinkedIn and webinars and incorporated customer insights module. Dynamics 365 for marketing examines interaction to generate more leads by configurable dashboards, analytics and reporting to examine nurturing campaign results and then determining the best performing lead sources and marketing activities. The alignment between marketing and sales is provided through sales collaboration panel. This will enable sales teams to grip the lead’s engagement with marketing activities, create notifications tight to lead’s activities and to explore campaigns that their assigned leads went through. Final judgment – Dynamics 365 for marketing suits the lead nurturing requirements optimally, however, recommends partner’s solution — Adobe Marketing Cloud for large enterprises. From the range of Salesforce products, three solutions are appropriate for providing lead nurturing. Those are- Sales Cloud, Salesforce Engage and Salesforce Pardot. Trail a visualized lead path to recap nurturing details swiftly. Final judgment – It is suited for organizations that entrust re-engaging cold leads to its sales representatives. In this scenario, the marketing department offers valuable content for satisfactory engagement and for generating new leads. Final judgment – It is a fine solution for sharing the nurturing responsibility between marketing and sales. It provides the sales team with a direct access to marketing assets to generate more leads and a resilient marketing automation functionality. Pardot is a marketing automation solution and empowers sales and marketing team to collaborate to generate more and better leads, nurture raw leads, re-engage cold/ postponed ones, optimize customer life-cycle and close deals faster. Native integration with Salesforce guarantees a quick and secure data sync with CRM. Improved understanding of buying intent and readiness. For this purpose, Pardot follows the interaction with the web content. If the visitor is anonymous, it figures out a firmographics. Utilizing flexible grading and scoring models that assist to prioritize leads automatically. This prioritization can be built on changing interest in the offering or on suitability between a lead’s features and the model lead profile. Personalization is supplemented by using a flexible nurturing campaign creator that supports dynamic content, rules, tags and triggers. Visual campaign trials are carried out to determine any drawbacks in the nurturing process. However, with too many segments to target, choosing activity options can become complicated. Therefore, most organizations with bigger workforce than 5000 lists limited scalability of Pardot as a con. The responsiveness factor rests on customizable notifications and a very convenient builder of automated greeting emails. The builder permits A/B testing of alternative templates and email rendering to check how the content is presented in prioritized email clients, browsers and on mobiles. The alertness factor for long-term lead nurturing is simplified with automatic tracking of leads’ activities – followed by sales-readiness scores and updates on profiles. Examining interaction with leads polishes the nurturing campaign by following through the analysis of email openings, click-through rates and review of campaign performance pointers. Automation rules for leads assignments that regulate the flow of warmed up leads from marketers to sales representatives. A highly collaborative ecosystem of the Salesforce platform built on tags and feeds, shared assets that permit marketers and sales reps to send a consistent message. Final Judgment – A recommended option for launching large-scale lead nurturing campaigns when both marketing and sales team actively contribute towards lead nurturing. However, some scoring points are deducted from Salesforce when considering the user reviews that detail the cons of using Salesforce. These include – limited scalability, limited reporting, limited WYG/WYS tools, limitations in automation rules, most interesting features only exclusive to pro-accounts. Considering pricing is one of the biggest con for Salesforce users, Microsoft Dynamics 365 is the more cost-efficient option. While with the feature-by-feature comparison you will find little to choose between Microsoft Dynamics 365 vs Salesforce, the price of those features is consistently lower with Microsoft. Furthermore, Salesforce has unfortunately developed a reputation for hidden costs, which don’t get revealed until after you are deep into the purchasing process. It sells all its add-on functionality, while in Microsoft, these features are all bundled. Plus, Salesforce overcharges for storage which can be as high as $250 per GB per month, compared to $5 per GB per month with Dynamics. As your platform matures this becomes more of a problem. Both Microsoft Dynamics 365 vs Salesforce offer great features that can be tailored to your requirements. You can also get add-ons from their respective online stores and make your CRM model even more productive and profitable for your business. Microsoft Dynamic’s capability to integrate seamlessly with Office 365 and Azure (which most offices already use) is one the biggest reasons why many would prefer Dynamics. Plus, Dynamics superior flexibility and scalability compared to Salesforce, give Dynamics an edge over its counterpart. Unlike Salesforce, Dynamics 365 is built on extensively used programming languages, like .Net, C#. This means you have a wider choice of developers to draw on and therefore it is easier to adjust your platform. There is an issue of getting locked in with Salesforce. Since much of its customizations are done in its proprietary code, it makes it difficult to switch and if you do switch, you’ll have to start from the scratch. Therefore, the longer you stay with Salesforce, the more you are set to lose if you eventually decide to switch. Other than that, Microsoft offers a promising future — with a whopping investment of $12 billion in R&D for automation, AI and Machine learning- Microsoft is pumping its research into Dynamics at an incredible rate and has put emphasis on it for future development. Comparatively, Salesforce has also realized this and started investing, but in terms of monetary investment, it can’t afford as much as Microsoft.